The base rate fallacy, also called base rate neglect or base rate bias, is a formal fallacy. If presented with related base rate information (i.e. generic, general information) and specific information (information pertaining only to a certain case), the mind tends to ignore the former and focus on the latter. Base rate neglect is a specific form of the more general extension neglect. The false negative rate: If the camera scans a terrorist, a bell will ring 99% of the time, and it will fail to ring 1% of the time. The false positive rate: If the camera scans a non-terrorist, a bell will not ring 99% of the time, but it will ring 1% of the time. Amos Tversky (Eds.). Choices, Values and Frames. CS1 maint: Extra text: editors list (link) ^ Nisbett, Richard E.; E. Borgida; R. Crandall; H. Reed (1976). "Popular induction: Information is not always informative". In J. S. Carroll & J. W. Payne (Eds.). Cognition and social behavior. 2. pp. 227–236. CS1 maint: Extra text: editors list (link) ^ Koehler, J. J. (2010). "The base rate fallacy reconsidered: Descriptive, normative, and methodological challenges". Behavioral and Brain Sciences. 19: 1. doi:10.1017/S0140525X00041157. ^ Barbey, A. K.; Sloman, S. A. (2007). "Base-rate respect: From ecological rationality to dual processes". Behavioral and Brain Sciences. 30 (3): 241–254; discussion 255–297. doi:10.1017/S0140525X07001653. PMID 17963533. ^ Tversky, A.; Kahneman, D. (1974). "Judgment under Uncertainty: Heuristics and Biases". Science. 185 (4157): 1124–1131. doi:10.1126/science.185.4157.1124. PMID 17835457. ^ Cosmides, Leda; John Tooby (1996). "Are humans good intuitive statisticians after all? Rethinking some conclusions of the literature on judgment under uncertainty". Cognition. 58: 1–73. doi:10.1016/0010-0277(95)00664-8. ^ a b Gigerenzer, G.; Hoffrage, U. (1995). 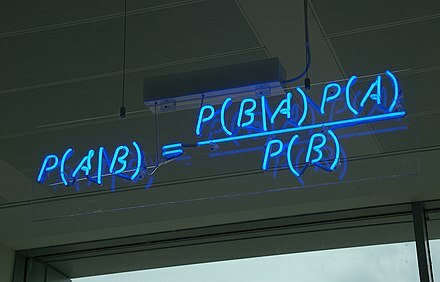 "How to improve Bayesian reasoning without instruction: Frequency formats". Psychological Review. 102 (4): 684. doi:10.1037/0033-295X.102.4.684. ^ Hoffrage, U.; Lindsey, S.; Hertwig, R.; Gigerenzer, G. (2000). "Medicine: Communicating Statistical Information". Science. 290 (5500): 2261–2262. doi:10.1126/science.290.5500.2261. PMID 11188724. ^ Akl, E. A.; Oxman, A. D.; Herrin, J.; Vist, G. E.; Terrenato, I.; Sperati, F.; Costiniuk, C.; Blank, D.; Schünemann, H. (2011). Schünemann, Holger, ed. "Using alternative statistical formats for presenting risks and risk reductions". The Cochrane Library. doi:10.1002/14651858.CD006776.pub2. ^ a b Sedlmeier, P.; Gigerenzer, G. (2001). "Teaching Bayesian reasoning in less than two hours". Journal of Experimental Psychology: General. 130 (3): 380. doi:10.1037/0096-3445.130.3.380. ^ Brase, G. L. (2009). "Pictorial representations in statistical reasoning". Applied Cognitive Psychology. 23 (3): 369–381. doi:10.1002/acp.1460. ^ Edwards, A.; Elwyn, G.; Mulley, A. (2002). "Explaining risks: Turning numerical data into meaningful pictures". BMJ. 324 (7341): 827–830. doi:10.1136/bmj.324.7341.827. PMC 1122766 . PMID 11934777. ^ Girotto, V.; Gonzalez, M. (2001). "Solving probabilistic and statistical problems: A matter of information structure and question form". Cognition. 78 (3): 247–276. doi:10.1016/S0010-0277(00)00133-5. PMID 11124351. ^ a b Hoffrage, U.; Gigerenzer, G.; Krauss, S.; Martignon, L. (2002). "Representation facilitates reasoning: What natural frequencies are and what they are not". Cognition. 84 (3): 343–352. doi:10.1016/S0010-0277(02)00050-1. PMID 12044739. ^ Gigerenzer, G.; Hoffrage, U. (1999). "Overcoming difficulties in Bayesian reasoning: A reply to Lewis and Keren (1999) and Mellers and McGraw (1999)". Psychological Review. 106 (2): 425. doi:10.1037/0033-295X.106.2.425. ^ Kleiter, G. D. (1994). "Natural Sampling: Rationality without Base Rates". Contributions to Mathematical Psychology, Psychometrics, and Methodology. Recent Research in Psychology. pp. 375–388. doi:10.1007/978-1-4612-4308-3_27. ISBN 978-0-387-94169-1.